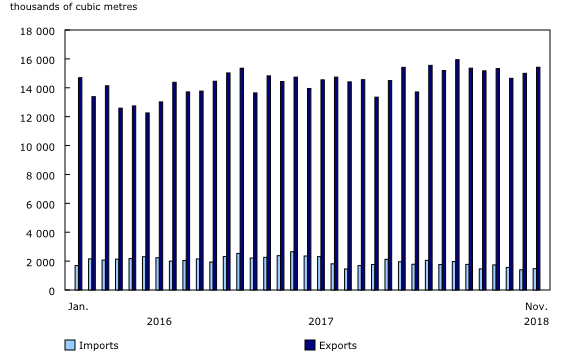 Pipelines in Canada received 21.9 million cubic metres of crude oil and equivalent products from fields and plants in November, up 2.4% compared with the same month in 2017. The vast majority of these receipts (87.8%) originated in Alberta. In November, closing inventories of crude oil totalled 12.5 million cubic metres, down 2.9% year over year. Pipelines delivered 7.8 million cubic metres of crude oil to Canadian refineries in November, up 7.2% compared with the same month a year earlier. Of the total volume, 62.6% was sent to refineries in the western provinces. In November, pipelines exported 15.4 million cubic metres of crude oil and equivalent products to the United States, up 15.5% year over year. Meanwhile, imports totalled 1.5 million cubic metres, down 16.6% from the previous year. 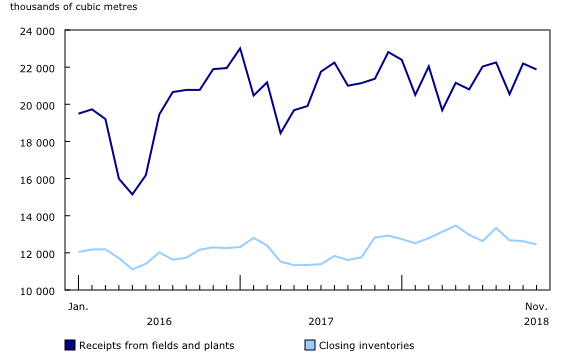 Pipelines received 2.9 million cubic metres of propane, butane, and other products from Canadian fields and plants in November, while closing inventories totalled 1.9 million cubic metres.